PaintScratch.com sells the highest quality Lexus paint pens for all Lexus years and models. Order a Lexus paint pen for your vehicle by clicking your model above. Next select your Lexus year and color order your Lexus touch up paint pen. Lexus is quite the success story having been founded not too long ago in 1989 and now being the largest-selling maker of premium cars from Japan. Not surprisingly, we get a lot of visitors who drive a Lexus and want to repair small paint scratches, chips and dings. 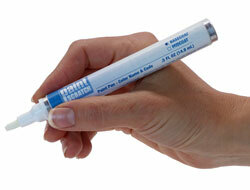 We're happy to tell you that we sell Lexus touch up paint pens in over 2,000 colors for every Lexus made since 1989! Whether you drive a 1990 Lexus GS300 with Black Onyx paint, a brand new Lexus LX570 painted with Starfire Pearl Tricoat, or any other model old or new, you can get a Lexus touch up paint pen from us. Select your model in the list here, and order a Lexus paint pen today! New York, NY "Great web site !!! So easy to use and had the products I was looking for including the clear coat"
Paso Robles, CA "YOUR SITE IS ONE OF THE BETTER SITES I'VE USED. IT 'FLOWS' WELL, AND EASY TO FOLLOW. TO DATE, ALL OF MY ORDERS HAVE BEEN COMPLETED WITHOUT ISSUES. THANKS,"
Virginia Beach, VA "I received my paint today and the color is a very good match. Thank you very much." Kailua-Kona, HI "Thanks for all your assistance in this matter. Your regular e-mail correspondence has been reassuring and representative of the great customer service your company provides." Athens, GA "Just wanted to let you know that an order I received for WG2 touch up matched perfectly, unlike the dealer stuff. I will definitely recommend your business. Thanks"